I saw today a truly remarkable statement which I thought that I would share with you. 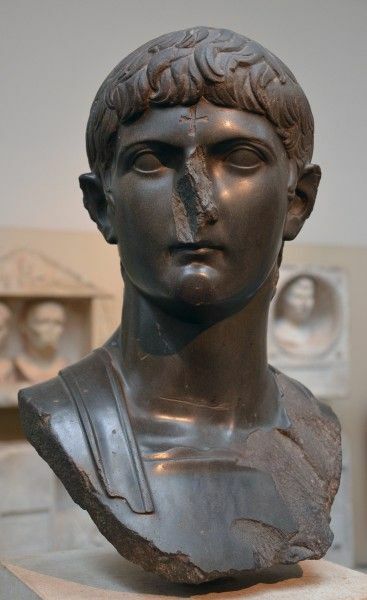 From the sixth century BC through the fourth century AD, sculpture had been created and destroyed, stolen and repositioned, but always prominently displayed and used in the context of Corinthian religion, economic activity, and urban life. Yet from about the fifth century, creation of new work dropped off rapidly, preceded by a decline in technical ability and availability of raw materials, and closely followed by the defacement and then destruction of most of what existed in public and private contexts. 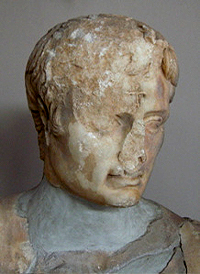 Between the fifth and tenth centuries, the only new sculpture created at Corinth was in the form of architectural members or Christian reliefs for church decoration, while ancient sculpture of “pagan” or “secular” significance alike was steadily marked with crosses, defaced, cut up, reused, or melted down. This new attitude to sculpture was a fundamental change of Late Antiquity, as individually and collectively people both ceased to create new sculpture, and undertook the actual physical destruction of most of what existed. This late antique change in attitude to sculpture happened all across the Roman Empire, and led both individuals and groups to behave toward the sculpted environment in new and hostile ways. This astonished me. Suddenly statues were hardly erected, except perhaps for a few official ones. Even these might well have a Chi-Rho on the top of the head, out of sight but “making the statue safe”. The destruction of statues by smashing the nose (or more) is well-known to us. Indeed it continued into early modern times, much to the mortification of excavators in 1901 where a workman, uncovering a small head of Aphrodite, promptly “battered the head”! This apparently happened “frequently” in early modern Greece. There is also the practice of “cross marking”. Greek crosses, with even sized members, tend to indicate post-Late Antiquity damage. But this is relatively rare, compared to the quantity of sculpture that survives. I found a number of examples at an anti-Christian hate site here. Brown’s paper references a number of the items, which reinforces the point about rarity. 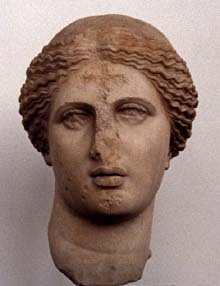 First a head of Aphrodite from the Agora at Athens, with crosses on forehead and chin. All of these, note, are of people, not of deities. Why smash the nose? I believe the answer to this may be found in hagiographical literature, where statues may be possessed by demons, or else talismans for magical purposes. There is a chain of references to follow, in order to get to the primary sources, but this is for another day. [If | he has cut off the tip of its ear, the tip of its nose, the tip of its finger, if he battered it, even though he did not break off [any part of] it—he has nullified it. No doubt this thinking was pretty general. The chains of references are a bit long in the above volumes. We could use some better presentation of the evidence on this. Thank you for this, with all its varied details! “There is a chain of references to follow, in order to get to the primary sources, but this is for another day” – and, looking forward to that (in good time)! “All of these, note, are of people, not of deities.” That is very interesting – might it have to do with ‘deified’ people? Or simply with dangers of possible excessive reverence? It is striking how ‘moderately’ damaged the first four (including an Olympian goddess!) 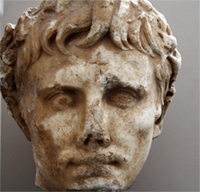 are – that cross on the forehead of Germanicus is quite elegantly worked out! Once ‘nullified’, they can be appreciated as art or history? It is also curious to compare signing with the cross in Baptism – and will your chain of references include details of rites of exorcism, I wonder? Yeah, most of those guys seem to be deified folks. If Joe Blow the Senator also got de-faced, that would be an interesting datum. The other thing is that I don’t think it was such a thing in Europe/the West, especially since we had new Christian statues and murals pretty early on, even before the Empire became Christian. (For example, the famous statue of Jesus that was supposedly in Syria.) The West was more into scribbling on pagan wallpaintings, whereas statue-clasm was just not as important. OTOH, there are strands of Greek belief that are still all about the smashing. Heck, even of corpses that might walk, in certain rural areas. Re: deification, IIRC there were lots of people who weren’t deified in Rome, but who were worshipped out in the Asian cities. Like high-ranking people from Rome who were big local benefactors. (As long as Senator Bobbus wasn’t still living in the city, that is.) And if someone was a dead local benefactor, no problema. I think it’s a classic case of where we need some literary testimonies. Indeed archaeological evidence suggests that the sculptures at Ephesus were on display for a period as long as 100 years after the carving of the crosses. 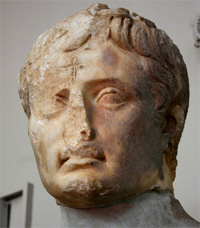 Just to clarify, the last two pictures are from the same statue that is the colossal portrait of Augustus from Ephesus displayed there in the Basilica with the portrait of Livia. In Antiquity, statues of despised individuals received the same punishment that human criminals received. In “The Handy Book of Terms, Phrases, Epithets…” by Edward Shelton (1879) is this entry: ” Rhinoculura.. the name of a colony of criminals who were transported to a spot near the desert between Egypt and Syria. These people having been found guilty of certain crimes, were punished by… cutting their noses off, and then banishing them to this spot.”. There is lots available on Rhinoculura and the punishment of rhinectomy in ancient times. .
It’s worth noting that the Biblical prohibition on making or worshipping (note: not merely owning) graven images is pluripotent: it applies to anything “in the heavens above or the earth below or the waters beneath the earth. It’s much stronger than the separate commandment to destroy idols. 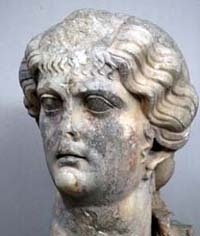 If this is what inspired the iconoclasts then it’s easy to see why they damaged human figures as well as images of deities, even if we don’t take the crossover between Roman leaders and gods into account: if it was wrong to make them, the iconoclasts may have reasoned, they deserve to be unmade. Alternatively, it may have just been a tangible demonstration of their desire to distinguish themselves from iconographers. There’s a new book by Catherine Nixey, The Darkening Age, which explains that the vandals who carved crosses in these Greek and Roman “idols” were committed Christians, and that the leader of all this was St, John Chrysostom. Published in 2018 and meticulously sourced. The book was poorly received, outside of reviews which seem to have been arranged by the publisher. x David Parker… Nixey fails to specify that of the tens of thousands of Greek and Roman statues found not even seventy have a cross carved. And she omits that according to the scholars who have dealt with this issue the carving of the crosses in those few statues whas a way of preserving the statues and not of destroying them (see my previous comment with the quote of Saradi). The examples she proposes are very few and she herself is very wary in stressing the interpretative problems of the archaeological context. The whole area seems to need more work. The lazy statements such as those by Nixey reflect assumptions rather than data, it seemed to me.